Good northern Thai-style food is hard enough to find in Bangkok. Yet a decent bowl of khao soi, the curry noodle soup that's quite possibly the region's most famous dish, is probably the most elusive thing of all. There are a few places in town that serve passable versions of khao soi. But most of Bangkok's bowls are creamy, bland approximations of the stuff up north. 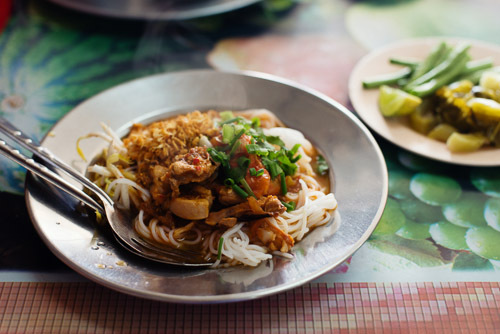 Those that do the best versions tend to have a direct link with Chiang Mai, which is the case with Khao Soi Chiang Mai. The original owner is a native of eponymous city, who, more than 40 years ago, started selling the mild Muslim-style khao soi associated with her hometown. 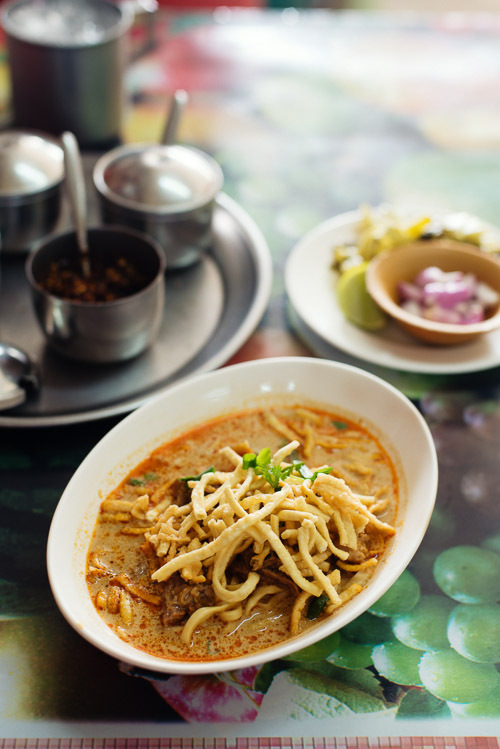 Chiang Mai's Muslim-style khao soi is not as spicy, rich or fragrant as the coconut milk curry-based broth served at the city's more famous Thai-Buddhist-run restaurants. Instead, the dish is comprised of two parts: a thick, rich, meat-based (beef or chicken) 'stew' and heated coconut cream that are combined to order. The result is a mix that, when done properly (such as that served at Chiang Mai's Khao Soi Prince), is pleasantly mild, but not bland, with a consistency somewhere between watery and creamy, and with a subtle, almost indistinguishable flavour of dried spice. Khao Soi Chiang Mai's is the closest I've come to this version of the dish in Bangkok. Again, it's worth reiterating that those expecting heaps of chili and spice will be disappointed; both the beef and chicken versions here are very mild, the former being slightly less so. Admittedly, a bit of seasoning is required, but once done, it's on par with versions served up in Chiang Mai. Also as in Chiang Mai, the noodles here are smooth and dense, and here are made in-house. And the khao soi is served with sides of slices of lime, thinly-sliced shallots and good-quality pickled cabbage. Unfortunately the version here is neither particularly rich (as it is in Chiang Mai and Chiang Rai) nor tart (as it is up in Mae Hong Son). 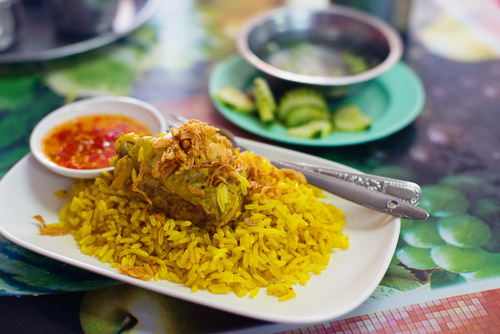 chicken biryani, served here very Thai-style, ie the rice appears to be seasoned with little more than turmeric, and comes accompanied with a very sweet dipping sauce; chicken satay; and 'Muslim' salad: lettuce, eggs and tofu served with a sweet peanut-based dressing. All OK, but the main reason to come is that rarest of things in Bangkok, a real-deal khao soi.